It’s been a sad few weeks with three music legends dying: BB King, Ben E King and Percy Sledge. In tribute to Percy Sledge I had to write up one of the greatest cheating songs: When A Man Loves a Woman. Bang a capo on the first fret and it works perfectly on ukulele. Two ponderous downstrums per chord will get you through the verses. In the verse it’s four downstrums per chord. But at the end of the first and second lines there’s a little walk down on the A-string. There do three long downstrums on the C. Then one quick downstrum each on C – Cmaj7 – C7. If you prefer you can just play 3 – 2 – 1 on the A-string. 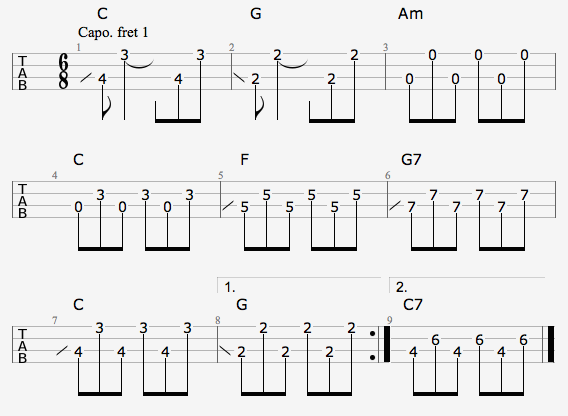 Again, this is played with a capo at the first fret.